I first thought “Not another novel about Lithuanian immigrants in South Africa.” Then I quickly realized that this is definitely the best of that bunch. Isaac Helger is a red-headed high school dropout, wandering the streets of Johannesburg in the 30s, full of schemes that he hopes will lead to buying his mother a big new house. As Jews that fled Lithuania ahead of Hitler’s atrocities, the Helgers are minorities in a Christian country of mostly people of color – strangers in a strange land fighting for any opportunity. The dusty landscape of South Africa sprinkled liberally with snatches of Yiddish, Afrikaans, and Zulu might indicate a specific exotic story but this is truly a universal tale – a mother who wants what is best for her only son, a son desperately trying to make his mark, and the unusual characters that hinder and help them along. A powerful family saga, The Lion Seeker is a thrilling ride through the life of Isaac Helger, from redheaded hooligan on the streets of Johannesburg to striving young man on the make. Growing up in the shadow of World War II, Isaac is caught between his mother’s urgent ambition to bring her sisters to safety out of the old world and his own desire for the freedoms of the new. But soon his mother’s carefully guarded secret takes them to the diamond mines, where mysteries are unveiled in the desert rocks and Isaac begins to learn the bittersweet reality of success bought at truly any cost. "A taut, visceral account of a young Jewish boy's African life… offering at times page-turning thrills and at others a painful meditation on destiny and volition." "[A] master storyteller... Bonert's zest for description, his attention to social nuances, and his eagerness to tell a large story in a large way... [creates] a big, richly detailed novel." "[A] suspenseful, entertaining, and thought provoking epic. . . Recommended to Jewish and philo-Semitic readers who enjoy family sagas, coming of age tales, long epic novels, and learning about a Jewish community with whom they might not be well acquainted." "Simply a stunning piece of work. . . 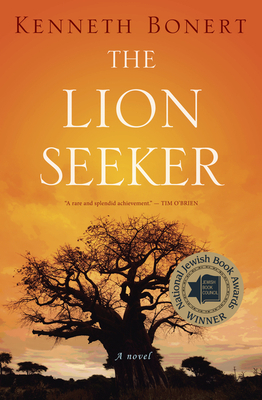 If The Lion Seeker wasn't the best Jewish novel I'd read in 2013, it was damn close." "What a rare and splendid achievement this novel is—emotionally gripping, intellectually challenging, deftly plotted, skillfully composed, and vibrantly alive with the images and sounds and textures and human flurry of another time and place. I was dazzled. And I was moved." "[Isaac's] is a story of fighting and deciding what's worth fighting for, of cultivating a strength that doesn't erase empathy. . . The pages turn quickly, with suspenseful prose and colorful vernacular dialogue that could easily be used in a blockbuster film." "[The Lion Seeker] will grab readers everywhere with the story of the struggling refugees in a new country, the horror they escaped from, and the guilt about those left behind, with secrets not revealed until the very end. . . The immigrant family struggle comes across as universal, whether concerning radicals or the ultra-Orthodox. . . A great choice for book-group discussion." "South African-born Canadian writer Bonert serves up a latter-day Exodus in this debut novel." "Raw and ambitious. . . The compulsive energy and passion of [Bonert's] prose is well matched to the feverish longings of his deeply flawed protagonist, and the book gains speed and urgency as it steams along." "Here is the South African novel I've been waiting for. Kenneth Bonert tells it true, not safe. His protagonist is worthy of Isaac Bashevis Singer, and the South Africa he gives us vivid, raw, dangerous, shot through with moral complexity." "The Lion Seeker is a powerful and thoroughly engrossing novel, grand in scope, richly imagined, full of dramatic incident, and crafted in a prose that is by turns roughhewn and lyrical. To read it is to be reminded how great a great novel can be." "A remarkably assured debut, The Lion Seeker is a riveting, lyrical, and profound journey towards the intersection of private lives and public destinies. Kenneth Bonert has all the makings of a major novelist." "The Lion Seeker is no-holds-barred, bare-knuckle-fight raw. A historical novel that feels desperately current; a Rosenburg and Juliet love story shorn of all sentiment; a stock-taking of human brutality and its flip side, our capacity to reach beyond our limitations and be better, all rendered in prose so expert, so fine honed that it belies the adjective ‘debut.’ It joins classics like J.M. Coetzee’s Disgrace and Rian Malan’s My Traitor’s Heart in the canon, and renders the South African experience universal. A first-round knock-out for Kenneth Bonert." "This powerful novel begins with a mystery that propels its characters through their difficult lives in prewar South Africa and haunts their actions until a dramatic and searing climax based on the Holocaust in Lithuania. The Lion Seeker is vivid and illuminating, astonishing in its range and toughness, and simultaneously an expression of love and regret for all that has been lost." "An emotional tour de force that plumbs the depths of human hope, fear, guilt, and rage, and bears all the hallmarks of a masterwork." "A titanic novel. . . An epic, a vast story about a rarefied subject: the community of Ashkenazi Jews who emigrated to South Africa before World War II. . . Mazel tov, Kenneth Bonert, you have written a blockbuster of a book." "Bonert's prose is sharp and masterful, clipping along at a breathless pace while still managing to wow us with imagery, clever turns of phrase and believable dialogue peppered with several languages." "The Lion Seeker is astonishingly mature, admirably incautious. It moves with the sleight-of-hand of the born artist, ramping up for naked tugs at the heart. . . It's visually and thematically sweeping, rich with diverse personalities, packed with tender waves and roiling crests of love, loss, hope, hatred. It casts its bit players (even a final-act dog) as deftly as its stars. . . This novel, quite apart from what it might become, remains completely and thrillingly itself." "If not for the setting-South Africa in the 1930s and '40s-the novel's hapless protagonist could have been plucked from the doom-laden pages of Thomas Hardy. . . The Lion Seeker, like its 19th-century literary forebears, is larded with enough plot twists, reversals of fortune, and revelations of family secrets to keep many readers engrossed."